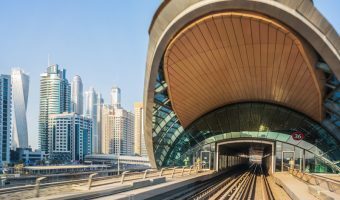 Jumeirah Lakes Towers Metro Station (JLT) is a station on the Red Line of the Dubai Metro system. It serves the southern end of both Jumeirah Lakes Towers and Dubai Marina. Places of interest nearby include Dubai Marina Mall and the Almas Tower. The station is connected to the Dubai Tram system. Cross the footbridge over Sheikh Zayed Road to reach Jumeirah Lakes Towers Tram Station. Adjacent stations on the Red Line are Nakheel Harbour and Tower and DAMAC. Reel Cinemas Dubai Marina Mall (0.4 miles) - Small cinema at the Dubai Marina Mall. Dubai Marina Mall (0.4 miles) - Shopping mall at Dubai Marina. The Walk (0.6 miles) - Shopping and dining promenade at Jumeirah Beach Residence/Dubai Marina. Healey's Bar & Terrace (0.3 miles) - Upscale bar at the Bonnington Jumeirah Lakes Towers. Happy hour and ladies’ nights. Outdoor terrace offers good view of Jumeirah Lakes Towers. Shades (0.5 miles) - Terrace lounge and restaurant on the fourth floor of the Address Dubai Marina. Overlooks the hotel’s infinity pool and offers good views of the Dubai Marina. Live entertainment and DJs. Mazina (0.5 miles) - All-day dining restaurant at the Address Dubai Marina. Serves a variety of cuisines from around the world. Show kitchens. Friday brunch. Fogueria (0.5 miles) - Brazilian churrascaria on the rooftop of the Ramada Plaza Jumeirah Beach. Offers an all-you-can-eat Brazilian BBQ and live music. Offers great views of Dubai Marina. Marina Social (0.5 miles) - Restaurant at the InterContinental Dubai Marina. Offers a British menu with Mediterranean influences. Led by Jason Atherton, a Michelin-starred chef that has worked with Gordon Ramsay. Friday brunch. JB's Gastropub (0.6 miles) - Pub at Jumeirah Beach Residence offering British and American favourites. Live sports, DJs, and generous portions. Map showing location of Jumeirah Lakes Towers Metro Station. 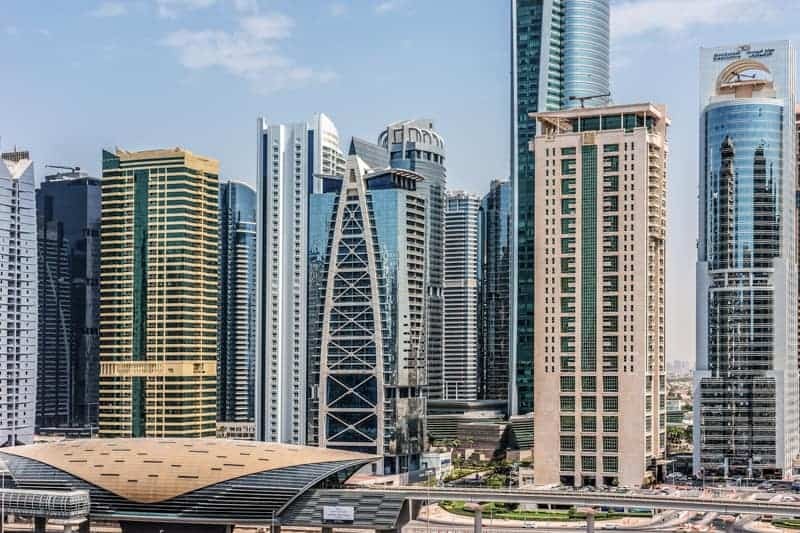 Guide to Jumeirah Lakes Towers. Includes hotels and places to stay, shops, how to get there, and an interactive map. 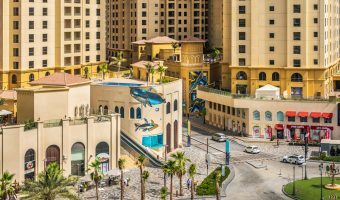 Guide to Nakheel Harbour and Tower Metro Station.